Staff and volunteers announce the final total raised – $393,522 – making the 10-year total $2.2 million. Organizers of the Miracles and Promises Radiothon at Akron Children’s Hospital Mahoning Valley marked two significant milestones in the event’s history this week. In this, its 10th anniversary at Beeghly campus, the total dollars raised surpassed $2 million. “It’s hard to believe it’s the 10th year,” said JoAnn Stock, senior director of development, Akron Children’s Hospital, who’s been there from the start. This year the event raised $393,522, pushing the 10-year total to $2.2 million. Norah Fenstermaker and her mother, Brittany, share the amazing story of how Akron Children’s Hospital Mahoning Valley helps the 5-year-old manage her Type 1 diabetes. Radio personalities from 570 WKBN and Mix 98.9 FM broadcasted live from the Building D lobby from 6 a.m. to 6 p.m. for two straight days interviewing patient families and hospital employees and volunteers, while community volunteers staffed phone banks nearby. 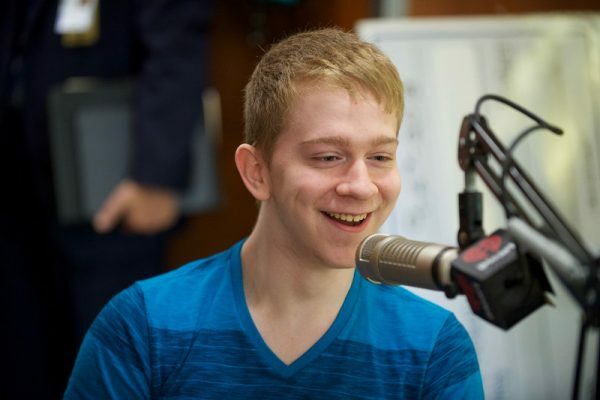 Cerebral palsy patient Tyler Jordan, 18, from Niles, has been interviewed live on the air at nine of the 10 Radiothons as listeners and donors track his progression and growth through the years. Tyler Jordan shares his story at the 2018 Miracles and Promises Radiothon. “Last year Tyler said he’d do a back flip if people would call, and you could see the phone lines instantly light up,” his mother, Glenna Jordan, said. Stock credits a loyal team of volunteers who contribute to the event’s success. “What’s unique is a lot of the volunteers have been here every year, they know the drill and come back to help us each time,” she said. Three women employed at WalMart schedule their vacations around the Radiothon to be here, she said, and work the entirety of it on both days. Other WalMart employees staff the phone banks in shorter shifts. “It’s not only wonderful because of the dollars raised for the hospital, but for 24 hours times two radio stations we have the opportunity to tell the stories of so many local families who have benefitted from the services here at Akron Children’s,” Stock said. If you missed out on donating during the Radiothon, you can still make a pledge by visiting here.